These gluten free and vegan chocolate cupcakes are so incredibly moist and chocolaty! This gluten free cupcake recipe is so easy to follow and requires only 10 simple ingredients! I have been trying to figure out how to make a gluten free, vegan, and refined sugar free cupcake for YEARS and just could not get the texture right. Recipe development get’s a little difficult when you can’t have any of the ingredients in the traditional version. This one almost had me completely stumped! Every recipe I tried was a completely gummy mess. I also even ventured out and tried the box mixes at the store. Not only were they full of sugar, but they were super dense and dry! It wasn’t until I came across a chocolate muffin recipe from “The Vegan 8” that I thought it might be possible to make a moist gluten free, vegan, and refined sugar free cupcake. The chocolate muffin recipe is absolutely delicious and for a long time I would just use that recipe for cake and cupcakes. The only problem with the chocolate muffin recipe is that it’s a little more dense (as a muffin should be) than what I wanted for cupcakes. So I decided it was finally time to figure out how to make this chocolate muffin recipe into a chocolate cupcake recipe. To make the cupcakes a bit more tender, I upped the amount of starch in the recipe. Applesauce was added for some additional sweetness and to make the cupcakes more moist. I also added coconut sugar to make them sweeter. Even though they are refined sugar free, you still want them to be sweeter than you would a muffin. I also changed the amount of almond flour and oat flour used. The original recipe called for more almond flour than oat flour and I felt it left the texture a little more grainy than desired. I’m so happy with how this recipe turned out!! I just had a pretty big birthday a couple weeks ago and my husband and daughter made me a cake using this recipe. I cannot tell you how amazing it was to have a cake recipe that was simple enough that I didn’t have to make it myself. Not only that, but it was the first moist and tender cake I have had since going gluten free and dairy free which was really exciting! It was also my son’s first birthday last week so of course I had to make this recipe so we could all enjoy his birthday cake together! I even had some pretty big gluten free skeptics give it a try and tell me how delicious it was. They are a tough crowd so that was pretty exciting too! So let’s talk about how you make it! Sift Dry Ingredients: Sift dry ingredients into a bowl and whisk together. Add Remaining Ingredients: Add wet ingredients to the bowl and whisk until combined. Fill Muffin Tin: Line a muffin pan with muffin liners. Use a medium sized cookie scoop to fill the muffin liner 3/4 of the way full. Bake: Bake for 20 minutes or until a toothpick comes out clean. Frost: Once completely cooled, frost with your favorite gluten free and vegan frosting. Can I substitute the oat flour in this recipe? Can I substitute the almond flour in this recipe? I do not recommend any flour substitutions for this recipe. Without the use of eggs or cane sugar, these specific flours are crucial to the texture of these cupcakes. If you cannot have oat flour or almond flour but can have eggs and cane sugar, then I recommend this gluten free cupcake recipe from Gluten Free Palate. Can I use this recipe to make a cake instead of cupcakes? Yes! You can also make this recipe in a cake pan. Cook time will need to be increased depending on the size of the pan used. For two 6″ rounds the cook time is 30-35 minutes. I can’t have coconut, is there a different sugar I can use? Yes! Coconut sugar cooks and tastes very similar to brown sugar in baked recipes so brown sugar may be used instead. I do not recommend using cane sugar in this recipe as it could change the texture of the cupcakes significantly. I don’t have any oat flour on hand. Can I make my own? Yes! To make your own oat flour, add rolled or quick cooking oats to a blender or food processor and blend into a fine powder. Sift dry ingredients into a bowl and whisk together. Add wet ingredients to the bowl and whisk until combined. Use a medium sized cookie scoop to fill the muffin liner 3/4 of the way full. Once completely cooled, frost with your favorite gluten free and vegan frosting. You can also make this recipe in a cake pan. Cook time will need to be increased depending on the size of the pan used. For two 6″ rounds the cook time is 30-35 minutes. 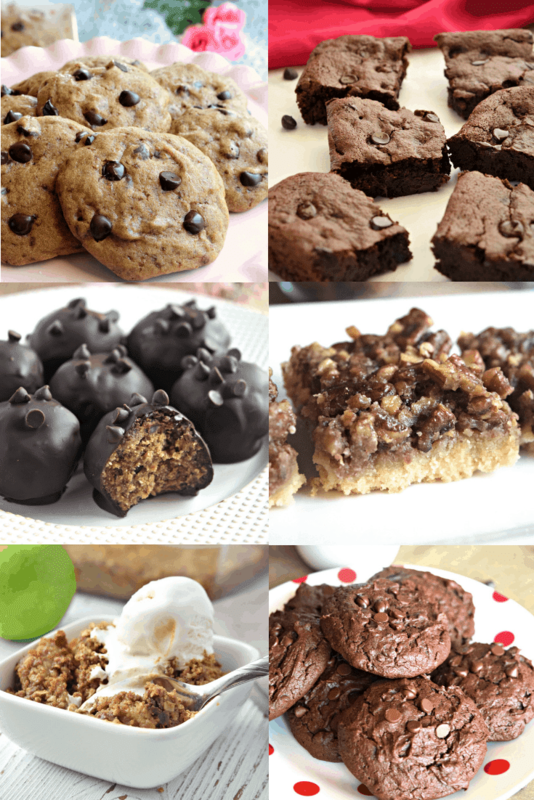 LOOKING FOR MORE DELICIOUS GLUTEN FREE DESSERT RECIPES? CHECK OUT SOME OF MY FAVORITES BELOW!